If you are thinking about buying a new construction home, you might be shocked to realize the lack of items and rights included in a Lennar warranty. A new home is the biggest – and least protected – investment you’ll ever make. Many people just skim the warranty portion of a new construction home because you’re told – and rightfully assume – that most everything is covered and you’ll enjoy the convenience of virtually no repairs. In fact, buying a new construction home built by Lennar provides you with very few consumer protections. You’ll be shocked to realize the lack of items and rights included in a Lennar warranty. Here are 12 things to understand about a Lennar home warranty before you make the commitment. You can download the current copy of the Lennar warranty terms here. 1. Lennar warranty basically covers only 1 year. Workmanship protection – covered in the year 1. Systems protection – covered in years 1-2. Structural protection – covered in years 1-10. I’m using Lennar’s terms of ‘protection.’ As you read the home warranty in detail, you’ll realize that there are many critical components – and your rights – that are explicitly excluded from the Lennar warranty. The average new Lennar home sells at $375,000 and includes a limited 1,2,10 home warranty. The average new car costs $34,968 and usually includes a bumper-to-bumper warranty of 3 years. In other words, you are paying 972% more and getting 200% less in warranty protection and rights. Note – there is no true ‘lemon law’ for new construction homes as there is in buying a new or used car. 2. 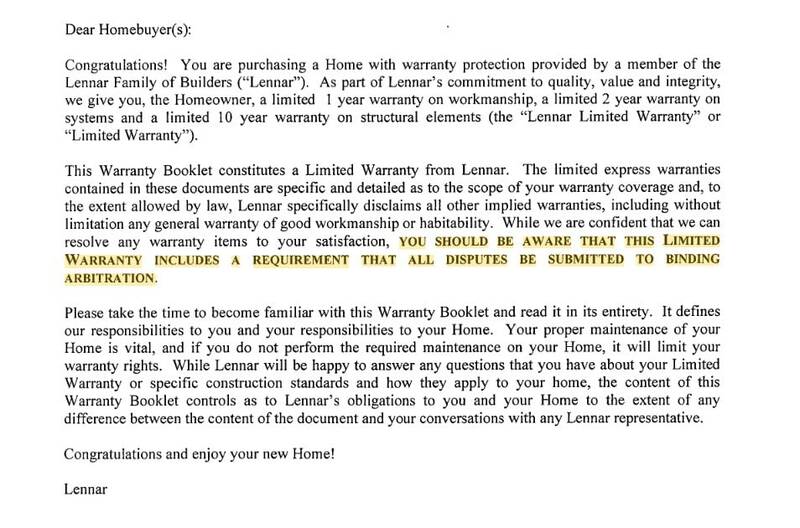 The Lennar warranty includes a requirement for binding arbitration. Lennar is notorious for denying or ignoring warranty claims and repairs. Many people talk about ‘suing Lennar’ to get what is rightfully theirs after a purchase of this size – a functioning and safe home. You should be aware that this limited warranty includes a requirement that all disputes be submitted to binding arbitration. I left the obnoxious all caps and bold out for your benefit. Just under the chipper welcome, any Lennar warranty disputes must go through arbitration. This is much different than a civil lawsuit or litigation. Unlike litigation, arbitration takes place out of court: the two sides select an impartial third party, known as an arbitrator; agree in advance to comply with the arbitrator’s award; and then participate in a hearing at which both sides can present evidence and testimony. The arbitrator’s decision is usually final, and courts rarely reexamine it. In other words, you’re not going before a judge, you aren’t going before a jury, you are going in front of a professional (or group) legal settlement arbitrator. The binding part means that whatever they determine is the final outcome and you have little or no opportunity to appeal the decision. In states like Florida, you must first pay to file and go through the 558 process before you can even consider filing an arbitration claim. Basically – it’s all for the benefit of Lennar and many of the laws for construction litigation are designed to protect the builder. Even if you are able to find some loop-hole that isn’t required to be arbitrated, Lennar makes you waive your right to a trial-by-jury. They even do the same all caps and bold to make sure you see this in their home warranty. Buyer acknowledges that justice will be best served if issues regarding this agreement are heard by a judge in a court proceeding, and not a jury. Yeah – that’s not justice for the buyer. But you are agreeing to this when you buy a new construction Lennar home. The Lennar warranty waives your rights to a trial-by-jury. Lennar does NOT like bad press. 3. Lennar has sole discretion to determine if your warranty claim is valid. According to the home warranty you accept, Lennar – and only Lennar – determines whether the issue you report is a valid warranty claim. Considering that they fight or ignore so many claims, that should come as no surprise. If a component is performing in accordance with [Workmanship Standards/Systems Standards/Structural Standards], then Lennar has no further obligations under the Lennar Limited Warranty. Lennar reserves the sole right to determine the repairs and or replacements necessary to meet the [Workmanship/Systems/Structural] standards. What does that mean? If they don’t want to repair it, they don’t have to repair it by simply declaring the component is performing in accordance with ‘standards.’ Get used to hearing that your claim is NOT a valid warranty repair item. Just record it and play it on a loop. You’ll hear that – or some variation – so many times from Lennar. Or they just will stop responding or won’t respond at all. Lennar has sole rights in determining whether your warranty claim is valid. @Lennar Submitted 4 cases yesterday morning. Received no response from anyone! Yesterday afternoon called and talked 800-698-1929. Received no response by now! No follow-up from anyone from Lennar! 4. Lennar warranty is transferable – but they are also bound to the arbitration clause. 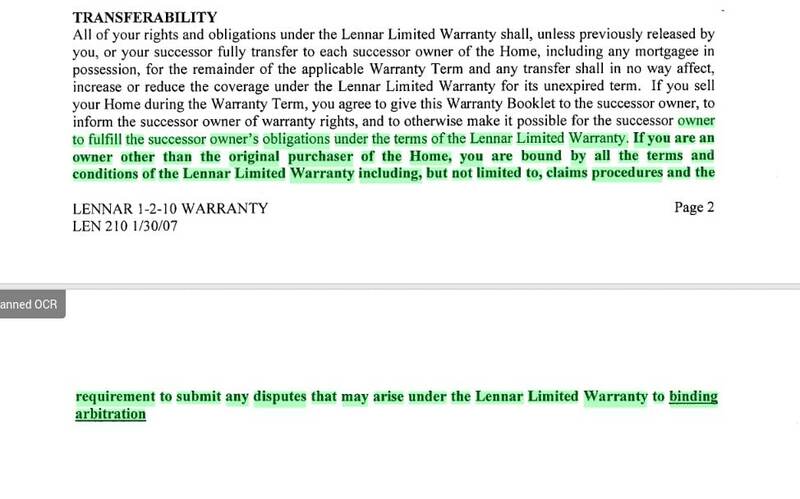 If you an owner other than original purchaser of the Home, you are bound by all the terms and conditions of the Lennar Limited Warranty including, but not limited to, claims procedures and the requirement to submit any disputes that may arise under the Lennar Limited Warranty to binding arbitration. Lennar really wants to make sure it happens in binding arbitration. You’ll realize why soon. The Lennar warranty is transferable to a new owner – but the binding arbitration goes with the transfer. 5. Lennar warranty requires you to let them into your home whenever they want. The wording in this part of the Lennar home warranty is clear – they decide when they show up – and have full access to your home – between the hours of 8-5. If you don’t agree, you void the claim. By submitting a Notice of Claim, you agree to let Lennar and/or their representatives prompt and complete access to your Home during normal business hours of 8 a.m to 5 p.m to inspect, repair and conduct tests in your Home as we may deem necessary. If you refuse to allow us access to your Home, such denial of access shall void the Lennar Limited Warranty with respect to your claim. It might seem extreme, but Lennar has been known to deny warranty claims for more ridiculous things. The Lennar home warranty doesn’t give you many rights – including what parts of your home they can access and when they can access the home. 6. Lennar warranty requires you to pay the costs of your arbitration dispute, including any attorney’s fees. Thinking of putting a litigation/arbitration claim against Lennar? You better have tens of thousands of dollars ready to hand over to an attorney (more on those costs further below). Unless otherwise recoverable by law or statute, each of Buyer and Seller shall bear its own costs and expenses, including attorneys’ fees and paraprofessional fees, for any mediation or arbitration. Lennar is really going to town with the arbitration stipulations. 7. If your disputes go to arbitration, expect to pay a minimum of $50K-$100K in legal fees. Yes – you heard that. I have already spent over $100K myself in legal fees for essentially nothing. Where did I get the $50K-$100K in legal fees from? It’s what’s been quoted to me and other people multiple times. For the most part (there are exceptions), you should only expect to recover the cost of the construction defects – and nothing more (more on that below). Considering the average cost of a new Lennar home, that’s an additional 15%-31% of the cost of the home just to get one in the condition it should have been delivered. After saving for downpayments, drapes/blinds and everything else for your new Lennar home, how many people are going to have the ability to spend that on legal costs? Not many yet it appears it’s your only option. That MUST change, and it’s up to us (Lennar homeowners) to make sure it does change. 8. If you go to arbitration with Lennar, then you can’t disclose that it even happened. Curious as to why Lennar is so adamant in making sure warranty disputes go to arbitration? This is one of the reasons. You give up all rights of disclosure in the claim. You can’t even disclose it happened, much less the reasons that you got to the point of arbitration because of the Lennar warranty. Except as required by law or for confirmation of an award, neither a party nor an arbitrator may disclose the existence, content or results of any arbitration hereunder without the prior written consent of both Buyer and Seller. Lennar never likes bad press. At all. 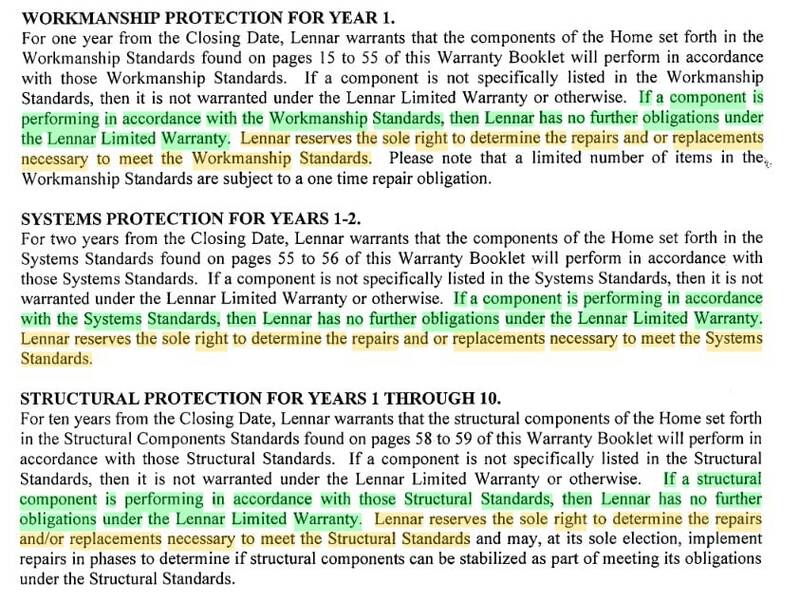 The Lennar warranty forces you to silence if you end up getting to the point of arbitration. Shame on you @Lennar my neighbors have been without heat for 3 Days? Several in our neighborhood due to the same furnaces installed in the WRONG locations. Fix your mistakes. 9. Lennar warranty does not cover almost any fixture or appliance. The Lennar home warranty seems to contain more exclusions than inclusions including not covering almost all fixtures and appliances in your new construction home. This includes all kitchen appliances, water heaters, bathtubs, washers, air conditioners, and alarms among other things. This is even though you are paying for them or upgrading at the time of purchase. What’s worse is that the warranty explicitly excludes you claiming any damages caused by any of these appliances or fixtures. This is even though you are paying for them or upgrading at the time of purchase. And you thought you got a full ‘bumper-to-bumper’ and worry-free warranty with a brand new home? Silly you. Lennar essentially wants to cover as little as possible and make you do the work – and incur the extra expenses. The Lennar home warranty excludes so many things that you thought you would have comfort knowing were covered by your new home warranty. 10. Lennar warranty does not cover mold and other hazardous conditions. Regardless of how badly they construct a home and how much damage it does to your belongings, your health or the health of others that happen to spend significant time in your home. Lennar is essentially saying “so sorry, but we aren’t responsible for that” in our home warranty. This would explain why they often do a poor job in their core of construction – they are making YOU sign off that they aren’t responsible for any of the damage, life or health impacts or their poor workmanship. It’s interesting that they mention mold, as that’s been a central theme in not only my issues but also of many people I’ve heard from. Just do a search on “Lennar mold issues.” It’s shocking. They also mention formaldehyde. That may seem unusual, but guess what? 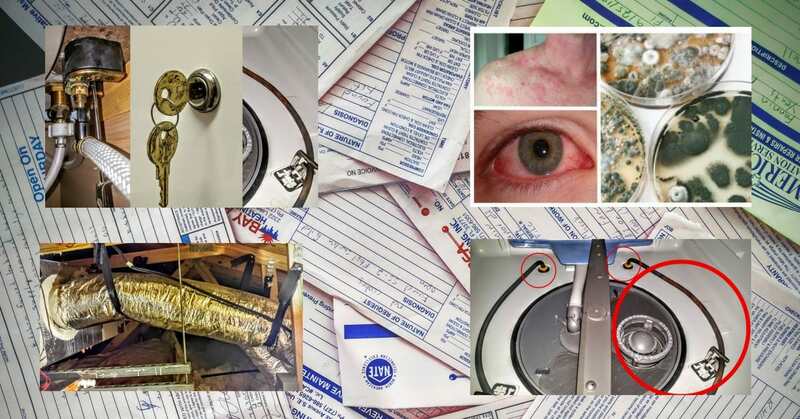 Formaldehyde illnesses are happening in Lennar homes in Colorado right now. Conveniently, they also mention metal corrosion which is also impacting most anything metal in my Lennar home. A Lennar home warranty seems to exclude a lot of things – including the impacts of toxins. 11. Most of the Lennar warranty outlines exclusions. Loss of use of all or part of your Home. 12. There’s a good chance you’ll want to fight the Lennar warranty process at some point. Don’t think you need to worry about any of this before you buy a new construction home by Lennar? All you need to do is a search on “Lennar reviews” or “Lennar construction problems” or do a search in any social media platform with the term “Lennar” and look at how many people have been abandoned or stung by Lennar’s home warranty. Explore this website and see how even the Lennar CEO responds to customer complaints. Research all of it, and then ask yourself if a Lennar home is worth potentially turning the life you love absolutely upsidedown. If you’ve learned anything from this article, it should be that a Lennar home warranty is going to give you little of the protection – or comfort – you thought you would have in buying a new construction home. I hope this helps you understand the Lennar warranty more. You can download the most current warranty (dated 01/2017) here. As always, it’s best to get a good attorney to review it all before you buy. I had that done before I purchased my home, but the attorney has now been disbarred. That will give you an indication of the quality of recommendations I received.